Fest 300: During your talk last night you discussed the alcohol-free gatherings at your apartment in [I think it was] lower manhattan that grew quite large. In your view, how did this experience influence those who attended, the local community and your love/relationship between each other? 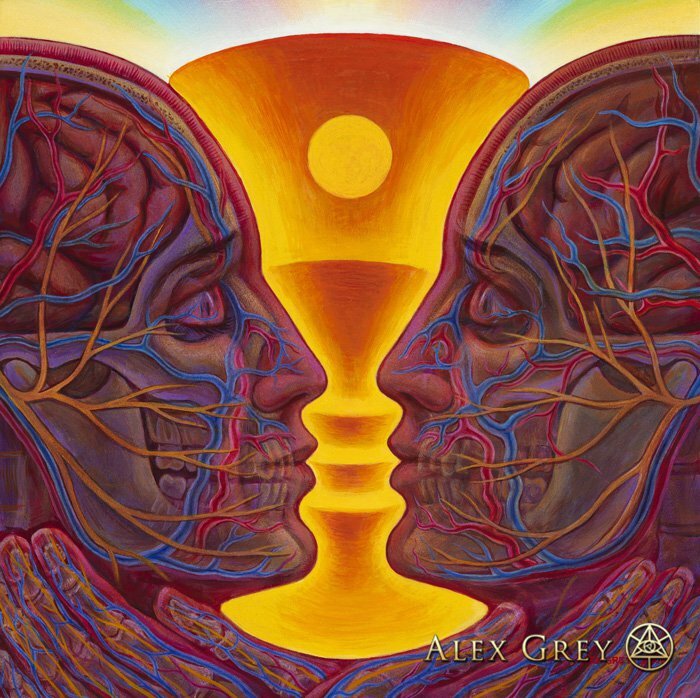 Alex Grey: CoSM events in our Brooklyn loft, at CoSM in Chelsea and at CoSM, the art sanctuary on 40 acres, , with few exceptions, are alcohol free. Great feedback from friends tell us that CoSM events are uplifting. Regarding our local community: Make more friends. 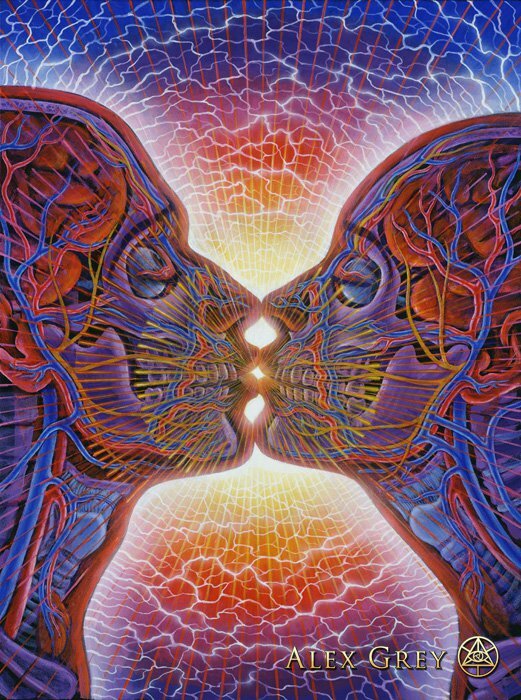 Regarding our love relationship: Ever ascending and evolving. Fest 300: The love you two share is so powerful. When you found each other, were you already walking parallel paths or did you find a new one together? What advice might you offer to those young struggling artists still trying to find their own Alex or Allyson? Alex: We met in art school in a Conceptual Art class in 1974. For both of us, our artwork more concerned concept and meaning than materials and traditional techniques, even though we were both well-trained, art school style, on techniques of drawing, design, composition, art history, etc. When we experienced the Divine through sacrament and intention, our work took the path of depicting our experience of divinity. Allyson, from a non-iconic tradition, chose abstraction, pattern and secret writing. Alex, brought up in the Christian tradition, chose to depict the visionary experience embodied in the "Progress of the Soul," the path of the individual. Advice for young artists and lovers: Follow your passion. Know that an enduring committed relationship is personally transformative. We become better people through being reflected, like a Sacred Mirror, in the eyes of the beloved. When we love another, we are shown our strengths and weaknesses and we modify our behaviors, becoming better people. Fest 300: In your view, what obligations do we have in the artistic community towards the social consciousness of the rest of our culture? Alex: Make art from passion, not obligation. When an artist makes their most uncompromisingly authentic and heart-ful statement, it touches others. A powerfully influential artist that has touched many is offered greater opportunities to support social consciousness. When many friends will listen to you, find a way to make a difference. Fest 300: What obstacles prevent artists and the community from reaching their full potential? What should they do to overcome these obstacles? Alex: Laziness is an obstacle. Being uncompromising in communicating the artist's personal statement celebrates uniqueness overcomes laziness. A lack of developed technique can limit an artist's ability to communicate their vision effectively. Studying and practicing overcomes that obstacle. Common artists either have nothing to say or are unclear about their message. Common artists lack technical skill. Great artists overcome those obstacles through "creative discontent." Extraordinary artists hear feedback from others and address areas in which their artwork falls short, doesn't deliver and neglects to connect with the viewer. Artists that are missing the attention they want may need to be more demanding on themselves. The mission of the M.A.G.I. curriculum at CoSM (Mystic Artists Guild International) is to identify and train artists to collaborate on building temple grounds at CoSM, a Visionary Art Sanctuary. Fest 300: Which festivals have you attended? Which do you like to attend together? Alex: We have live-painted side-by-side at all the festivals we've ever experienced. We are fortunate to have been sponsored by more festivals than we can name. Fest 300: What has been one (or two) of your most memorable festival experiences together? Alex: Burning Man is the crowning achievement of freedom and creativity in festival culture. CoSM has held an unbroken chain of Full Moon Ceremonies for over 13 years -- 147th is coming up. All mini-festivals. At multi-faceted events held every Equinox & Solstice at CoSM, attendance can reach small festival proportions. We study the festival model and include our glorious and graciously restored Victorian house for indoor ecstatic dance and the best DJ's including Tipper, Goudi, Base Nectar, David Starfire, Andralien and many others. Our favorite events are always at CoSM. Fest 300: What potential do you think festivals have towards the future evolution of human consciousness? Alex: Burning Man. It's a tough ride, can be expensive, and is extraordinary in it's management and organization. A model to study. In 2006, we co-created Entheon Village with MAPS and eco-genius, Matt Attwood. CoSM's 60-foot dome offered 24-hour live-painting and DJ chill space for the week that also included movies, figure drawing with live models and more. It was a crowning achievement for CoSM and crew. Live-painting our 32-foot mural, "Star Dancers" TWICE on our own stage before 25,000 friends at Tribe Festival in Brazil. "Star Dancers" was again erected at Burning Man by Area 51/Fractal Nation Camp in 2012. We painted "Star Dancers" for the fourth time in Williamsburgh, Brooklyn for Vice Magazine/Magic Hat Brewery city event and it was unforgettable. The mural is still underway and may be resurrected at CoSM for us to paint at outdoor summer events.